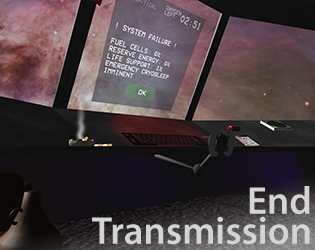 End Transmission is a first-person narrative exploration game that attempts to capture a brief, significant moment in a character's timeline. Left-click on objects and points of interest to interact. Right-click or spacebar to zoom back out. Control the ship's computer by following the on-screen prompts. Return or Enter can be used to accept confirmation prompts.